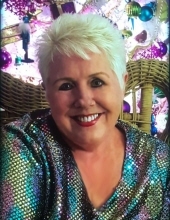 LINDA LOU GROVES, age 75, of Holiday Island, Arkansas and New Smyrna Beach, Florida departed this life after a sudden illness on Friday, February 1, 2019 with family by her side. Linda was born on March 14, 1943 in Union City, Tennessee to Robert Nathan Denman and Mary Ann McRee Denman while Robert was serving oversees in World War II. Upon his return, they moved to Indianapolis, Indiana where Linda grew up and graduated from Speedway High School. She worked over 30 years in administrative support positions for various companies and in the medical school arena. She always performed her work with dedication and an attitude of excellence, while making innumerable, life-long friends at each organization. It was through a medical school conference that Linda met and then married Jack Murray Groves in 1978, combining their two families of three into one family of six. Together Linda and Jack lived in Illinois, Oregon and Ohio before “retiring” to Holiday Island, Arkansas in 1999. Soon after, they opened and ran Groves Karate School for 12 years. Beginning in 2014, Linda and Jack began to divide their time between Arkansas and Florida, enjoying the natural beauty, activities and many friendships both had to offer. Linda was creative and talented and had a life-long passion for arts and crafts. Designing jewelry, being an excellent seamstress, baking and making beaded art are just some of the many ways she enthusiastically colored the world. She preferred things that were vibrant, sassy, beautiful and classy; all of which describe not only her work but also her personality. Linda loved being with and getting to know people, and she made friends everywhere she went. Linda was preceded in death by her mother, Mary Ann Bailey, and father, Robert Denman. She is survived by her husband, Jack Groves of Eureka Springs, AR; four children, Sunnie Belinda McRee of New Smyrna Beach, Florida, Andrea Stephens (Lance) of Houston, Texas, Michelle Baker (Alan) of Auburn, Illinois, and Garrett Groves of Wood River, Illinois; eight grandchildren and great-grandchildren, Danielle, Kyle, Tyler, Blake, Audrey, Brandon, Greyson and Easton; one brother, Stanley Denman (Annie) of Muskegon, Michigan, and many loved ones from her karate family. A Memorial Reception will be held 1:30-3:30pm, Saturday, February 9, 2019 at Groves Karate, 4052 E. Van Buren, Eureka Springs, Arkansas 72632. In lieu of flowers, donations may be sent in memory of Linda Groves to Good Shepherd Humane Society, 6486 Hwy 62 E, Eureka Springs, AR 72632. To send flowers or a remembrance gift to the family of Linda Lou Groves, please visit our Tribute Store. "Email Address" would like to share the life celebration of Linda Lou Groves. Click on the "link" to go to share a favorite memory or leave a condolence message for the family.